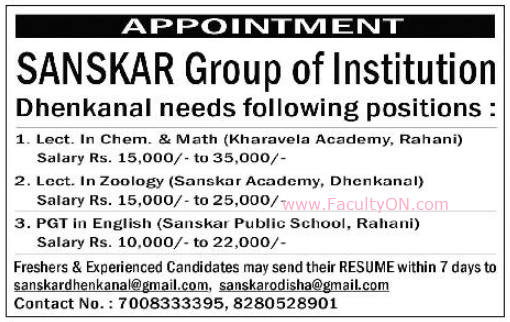 Sanskar Group of Institution, Dhenkanal has advertised in the SAMAJA newspaper for recruitment of Lecturers / PGT jobs vacancies. Interested and eligible job aspirants are requested to apply within 07 days from 01st October 2018. Check out further more details below. About College : Established in 2005, Sanskar Educational Group (SEG) spread over 20 acres of lush green campus under the aegis of Shree Ganpati Education Society has carved its niche just within a decade. Today it is considered a centre of excellence for those aspiring to undertake higher studies in the domains of Technology, Pharmacy, Management and Architecture. SEG runs Diploma, Graduate and Post Graduates level Engineering, Management, Pharmacy and Architecture programs. We aim sincerely to contribute, promote, encourage and embed habit of lifelong skills development to the world of crucial engineering, information technology, management & pharmaceuticals.